It has almost been a year since Sea of Thieves was released and so far, the game has seen four major updates, nine temporary events, and more than thirty game updates. To celebrate the start of the second year of the pirating lifestyle, a humongous Anniversary Update is coming. 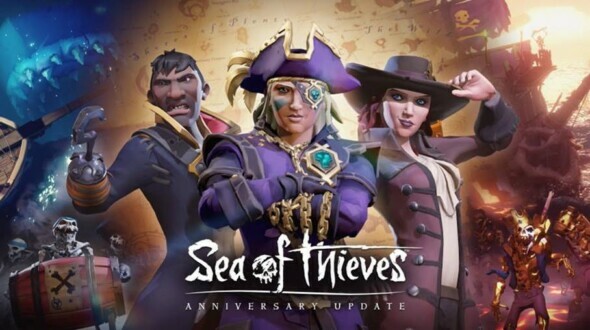 The Anniversary Update, which will be available for free on 30th of April for all players, will be the biggest content update Sea of Thieves has ever seen. Leading up to the grand release of the Anniversary Update, information will be shared via live streams on Mixer, Twitch, and YouTube. Here’s a rundown on what to expect, and when. More information on the new competitive game mode in which you and your friends battle against other crews. The Hunter’s Call is a new trading company which can offer you more possibilities to become the legends of piracy. This preview will showcase information on the trading company, the rewards and of course, the missives. Tall Tales is a collection of story missions players can complete solo or in co-op in a shared world. In the first collection titled Shores of Gold, players will be searching for the mystical Shores of Gold whilst experiencing a story of love, honor, and betrayal. New Mercenary Voyages with medleys in The Shores of Plenty and Devil’s Roar, including a new Reaper’s Run, new prestige and new cosmetics. A grand Gilded Mercenary Voyage of Legends is also available for the pirating legends. The impressive Captain Bones’ Original Pirate Cutless has been added to the weapons cache for everyone who has played the game during the first year. Players who have obtained the ‘Pirate Legend’ status during the first year will receive a Golden Legendary Tankard, a Golden Legendary Hurdy Gurdy and Golden Legendary ship components. All players with enough gold will be able to buy a Golden Sailor Hat and Golden Sailor Cannons for only 320 gold at all Outpost stores. This offer is available from today until the release of the Anniversary Update so be fast if you want some! A range of Sea of Thieves gamer avatars are available to spice up your Xbox Live page. A track titled We Shall Sail Together has been brought to digital channels such as Spotify, Deezer, Google Play, iTunes, Amazon Music and Tidal for free. If you haven’t played Sea of Thieves yet perhaps you should. The game is available via Xbox Game Pass for Xbox One or Windows 10.